You Can Ta Ka Di Mi This! I find the sounds and rhythms of India mysterious and captivating. The first time I heard my teacher Ramnod V. Raghavan play the mridangam (the principal accompaniment instrument in South Indian classical music), I had a "what the hell was that" feeling: a shift, a dance, a cadence on a part of the beat that I wasn't expecting. It was similar to when I saw the VSOP Quintet in 1975, consisting of the Miles Davis alumni; I had no idea what was happening, yet that visceral awakening had recurred. There are many ways to open oneself to hearing and feeling rhythm. I have found the South Indian system to be quite fascinating and helpful in taking the mystery out of rhythm. The Indian percussionists have taken rhythm to mind-boggling heights. At the core of their system are syllables, known in India as "solkattu." Musicians in this part of the world, regardless of their instrument, are required to know these syllables. In fact, most of the time they're required to "sing" the piece with syllables before they can play it on their instrument. The syllables vary from place to place, and even from teacher to teacher, and yet are building blocks of rhythm, from the simple to the complex. This book is about the connection between one voice and body. I intend to take some basic concept from the South Indian tradition-namely, the use spoken syllables-and use them as a vehicle for all musicians to ground and expand their sense of rhythm. The book will have two ongoing themes: reciting the syllables, and learning the corresponding Western notation. 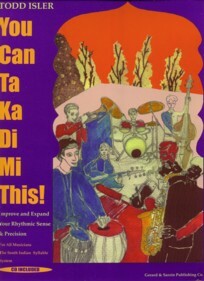 Whether you are a vocalist, drummer, or a French horn player, this book gives you the tools to ground your beat and expand your rhythmic comfort zone, especially in odd time signatures. As a teacher, I have discovered that my students have shown a marked improvement when singing a groove before they play it. In time you will simultaneously be able to feel "long" phrases containing several short ones, as well as a grounding of your personal beat. I encourage anyone interested in Indian rhythms to explore the listening and reading suggestions at the end of this book and go from there to other world music traditions. 72 Part 6: Reductions In Adi Tala Reduction in Adi Tala singing Tisra "3"
73 Reduction in Adi Tala singing Khanda "5"
74 Reduction in Adi Tala singing Misra "7"
75 Reduction in Adi Tala singing Sankirna "9"
86 Metric Modulation in Khanda "5"
88 Metric Modulation in Misra "7"